Home Blog Travel to Water Cities! It has been raining here and this morning I had to get up and stand in the rain at 6:30 for 20 min, waiting for a taxi. The taxi took YingYing and me to a train station where we caught a fast train to Hangzhou. After checking into the hotel, we walked around the old streets. Ying Ying told me legends, about the stories of the founding of the city, traditions of pharmacists and scholars being so important, it was an education just listening to her. She told me about the size of disks in front of the buildings indicating the prestige of the residents. We took photos, and ate “beggar’s chicken.” Then we visited an old rich man’s house. It was an amazing house, with a pond and rock sculptures, the first phone in the city. He had 12 wives, so the house was truly enormous! 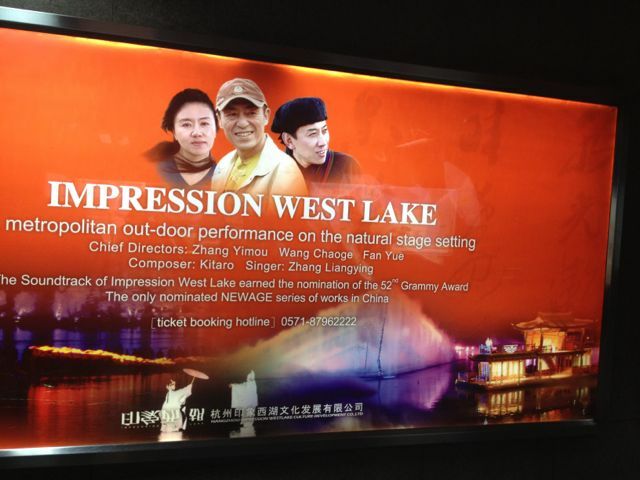 In the evening we went to a water show called “impression West Lake.” It involved the story that Ying Ying had told me (and ancient legend) enacted on a stage just millimeters below the water’s surface. The lights and many performers all reflected on the water! It actually looked like they were walking on water. It was a love story, with the most beautiful haunting music I have ever heard. We finished off the day by walking along the lake and across a causeway over one arm of the lake. What a special day!